The First Ride of 2011! First, Happy New Year! What better way to welcome the new year, than with an awesome bike ride through Goleta, Ca. While the weather was a tad on the chilly side, the brilliant, bright sun and clear weather made for a refreshing ride. My goal for this ride was simply to take it easy, go the distance and feel my muscles out for what they can put out. I was nervous that I lost some strength over the past few weeks since I haven’t been riding near as much as I’ve been running. What I discovered is that my muscles are doing just fine. While I did feel drained earlier than expected, I am quite happy with the outcome. The ride lasted 01:08:34 and covered 17.8 miles at an average speed of 15.6 mph. 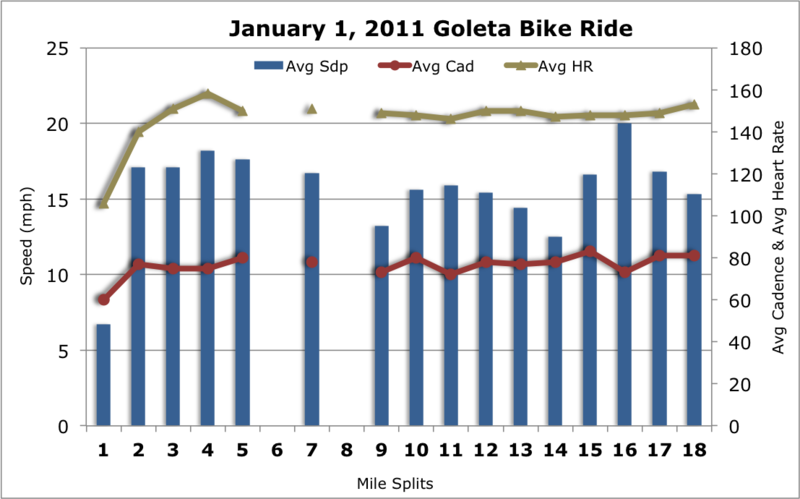 Not my fastest performance for the Goleta Loop, but I’ll take it. It took me about four miles before I got warmed up. I have no idea why I don’t have data for miles 6 and 8. The cadence and heart rate remains fairly consistent, with speed having the most deviation. I think this means I maintaining effort on hills and letting the speed slow down, where I should be trying harder to maintain speed with more effort. You can see that I cranked it up for the last two miles as the heart rate climbed steadily. Mile 16 is the fastest at nearly 20mph average thanks to a steady, downward slope. You can see the cadence is significantly lower as well since I didn’t maintain effort during this split. The point of this is to say that as I continue to train in 2011, I need to be fully aware of my body, my effort and what is happening around me. It is fine tuning the “mental edge” and putting mind over body (to a point!). The first ride of 2011 is in the history books. Not only did I get to enjoy some beautiful weather, but I learned a lot about how I ride… something to improve upon in 2011. This entry was posted in analysis, Cycling, Fitness, Training Charts, Workout Logs and tagged analysis, Cycling, Fitness, Training, Training Charts, triathlon training, workout. Bookmark the permalink.